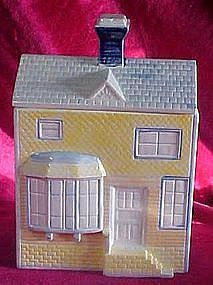 Small cookie jar measures 8 1/2" tall to the tip top of the chimney. looks to be made in a ceramics class. All hand painted and glazed. Two "very small" chips on the corners. Looks good!